I love painting, I think it's a great way to destress and decompress. I've also found it's when my daughter, who is pretty quiet, will tell me things about her day that she otherwise would keep to herself. Give her a paintbrush and a canvas and suddenly her mouth opens and she'll tell me all kinds of things that have been bothering her, or her dreams for the future that she's been hiding away. Is there someone in your life that you are trying to get to know better? Try having an art session with them and see if they open up to you! I'm a creative person, and as such I consider everything to be a "first draft". These $6 turquoise shoes from Walmart? First draft - they look so much more interesting when I used my craft stencil and white acrylic paint to embellish them while my son was in toddler soccer. Good will t-shirt? First draft - iron on ribbon from Michaels totally hid that tiny mark and updated the overall look. And yet, it took me forever to put two and two together. Coming up with a line of event stationery based on my original fine art was more of a sixth draft idea. Sometimes good things take time. I'm happier with this line of invitations than anything I've done before. Each one feels like an actual piece of art that I'm creating, because that's how it starts - just me, some yupo paper, and some of my favorite alcohol inks, getting messy and watching things flow and take on a life of their own, under my direction. change the font. This is probably the easiest change to make and creates the biggest impact. You can go from old school romantic to trendy hipster in one move. include your language(s). I'm from Toronto, and am used to working with couples from a variety of backgrounds. Sometimes an invitation needs to be in English and French, sometimes in English and Portugese, sometimes a few need to be in English, Serbian and Dutch (ok, that was me). I think it's cool to see a couple's unique heritage reflected in an invitation. 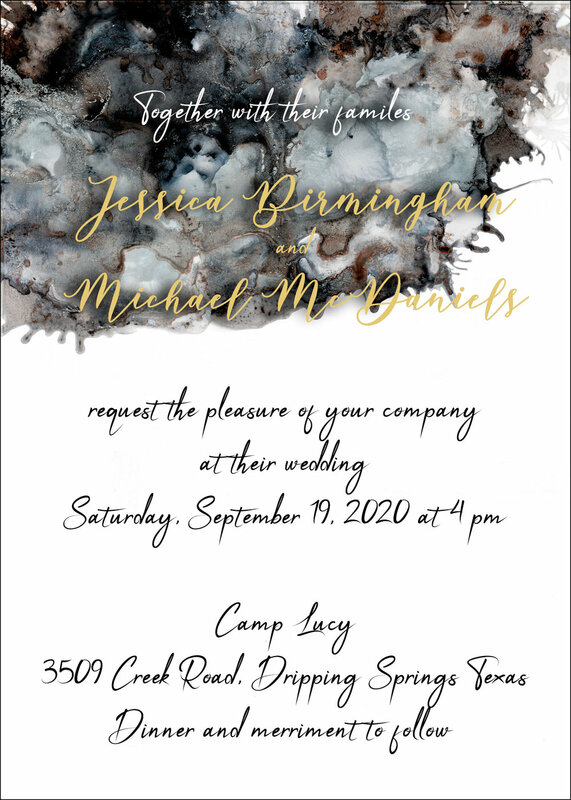 My Grey Frost invitation was created using the acrylic fluid pour method. Seriously fun and seriously messy. My kitchen table - ahem, my art studio, excuse me - has never been quite the same. I hope this gives you some ideas when it comes to invitations and ways to make them a little bit more your own. Every event - wedding, anniversary, birthday - deserves to be recognized as the unique experience it is, and that starts with the invitation!